The Stone Partridge, Ptilopachus petrosus also known as Keklik is an African bird of the pheasant family commonly found in Central Africa from the west coast to Kenya. It is the only member in monotypic (one single species) genus Ptilopachus. The Stone Partridge has been imported to the United States to establish private collections and to parts of Europe, where it is hunted for sport. 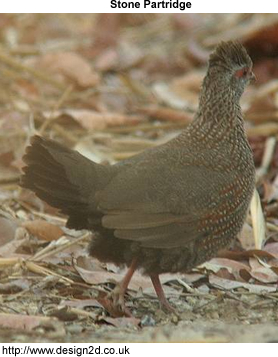 Widespread and common throughout its large range, the Stone Partridge is evaluated as Least Concern on the IUCN Red List of Threatened Species.